The arrangement study against street vendors (PKL) in Tanah Abang, Central Jakarta, is targeted for completion on Friday (11/3). Thus, it can directly be executed on Monday (11/5).
" 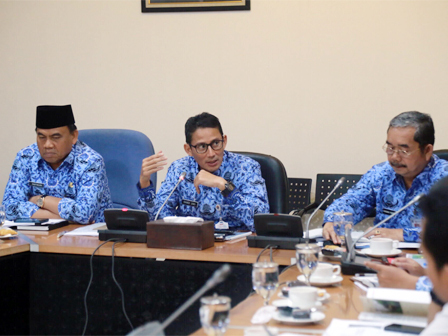 All parties attend here we give deadline up to Friday to finalize solutions PKL, either it is short term or long term"
Jakarta Deputy Governor, Sandiaga Uno expressed, he has held a coordination meeting (rakor) with Transportation Dept. KUMKMP Dept., PD Pasar Jaya, PT Transportasi Jakarta, Jakarta Smart City and PT KAI. "Several proposals have been saved. All parties who attend here we give deadline up to Friday to finalize solutions PKL, either it is short term or long term," he stated, after he led the meeting about Arrangement of Tanah Abang area, at Jakarta City Hall, Monday (10/30). He explained several proposals that have been delivered are sky bridge development, traffic engineering, road users mobility, and land utilization belongs to PT KAI to relocate PKL regarding revitalization of Block G.
"For short-term solution, there must be breakthroughs and innovations. While for long-term, there will be arrangement in the concept of TOD," he expressed. He added, in implementing a policy must be really data-based to see the impact and benefits for the people.